Special Note: This pudding is not only delicious and easy to make, but very versatile. Eat it with gusto and know that you will have energy for a long time afterward. 1. Open the Thai coconut, remove the meat, and measure out 1 cup of the coconut water. 2. Place coconut meat, and water in high speed blender and blend till creamy and smooth. 4. Add mangos, orange juice, vanilla and salt, and then blend for about 10 seconds more. Taste before adding sweetener to determine how much is needed. This depends on the sweetness of the fruit used. 5. Do not over blend. 8. When chilled, layer the pudding in 4 parfait glasses with sliced banana rings or Kiwi slices or top with a mint leaf and a slice of orange. 9. This recipe takes only 5 minutes to prepare as a quick breakfast treat, or a cool summer evening dessert. The kids love this easy nutritious blend of flavors. 10. If you want more fiber in your diet, use almonds with the skin instead of cashews. They add a whole new dimension to the pudding. 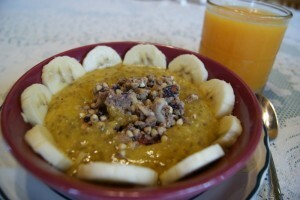 • Instead of Mangos, use 2 Bananas to make a succulent dessert or breakfast treat. Layer the parfait with Banana rings and chopped cashews. • Chia is valuable for Omega 3 oils, for cleansing the bowel, giving energy to the body, and beneficial proteins. Use whole or ground to vary the texture of the pudding.